This object is currently on display in room . There are 4 other images of this object. See our image rights statement. See more objects with the tag interior, children, seating, brightly colored, table, cut-out, bent. See more objects with the color saddlebrown maroon grey or see all the colors for this object. This is a Child's chair. It is dated 1957 and we acquired it in 2007. Its medium is painted bent beech plywood. It is a part of the Product Design and Decorative Arts department. Kristian Vedel, known primarily for his furniture designs, was a student of Danish architect and designer Kaare Klint, founding professor of the department of furniture at the Royal Danish Academy of Fine Arts. Under Klint, Vedel participated in the Copenhagen Cabinet-makers’ Guild furniture exhibitions, and was honored by the Guild as early as 1947. In 1962, Vedel won the Lunning Prize (awarded to eminent Scandinavian designers) in recognition of his designs for original and innovative utilitarian products. Vedel’s designs were greatly influenced by the Bauhaus aesthetic and Klint’s standards of economy, function, and simplicity, and demonstrate a great consideration for material and production process across a variety of media. 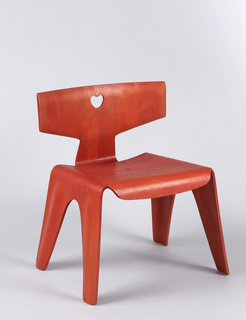 Although Vedel was best known for his furniture, his output also included product design. 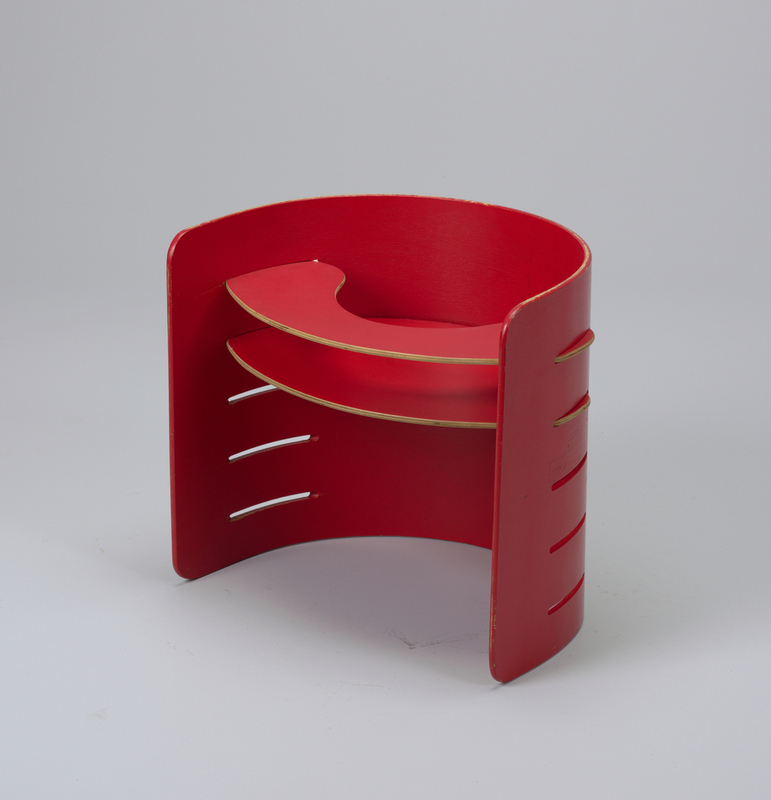 The museum has examples of the stacking egg cup from the melamine plastic Gourmet line (1958), which he designed for Torben Ørskov, the manufacturer of this child’s chair. The chair under consideration is composed of a curved, slotted, laminated plywood shell into which a variety of planar components—seats, shelves, and table tops—can be inserted at different heights. Used individually or in combinations of up to four, it can be adjusted for growing children and configured into a variety of forms, such as a high chair, desk, or play station. 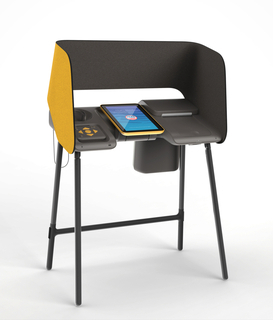 This adaptable piece also appears as a telephone table in one period photograph, each slot holding a seat functioning as a shelf for a phone book. This simple, highly versatile form was Vedel’s first major design and was awarded the silver medal at the 1957 Milan Triennale. This is one of a pair of Vedel’s children’s chairs being offered as a gift. This innovative piece would enhance Cooper-Hewitt’s holdings of both mid-20th century Scandinavian furniture and children’s furniture. The chairs would also supplement our group of bentwood and molded plywood furniture, which includes examples of 19th-century Thonet seating pieces as well as the Frank Gehry Cross Check chair (1994), and would help to tell the story of this significant production method. This object was donated by Jacqueline Loewe Fowler. It is credited Gift of Jacqueline Loewe Fowler.